The Entertainment Weekly has published a new photo from actor Jerry Bruckheimer's Prince of Persia: The Sands of Time movie. 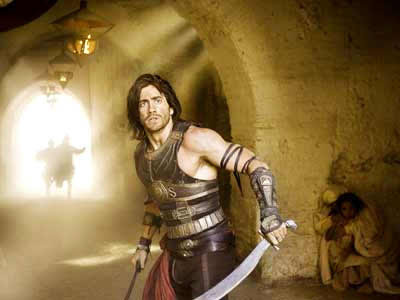 Entertainment Weekly (EW) has first to released an official photo from Prince of Persia Sands of Time. This film based on the popular video game of the same name Prince of Persia Sands of Time. Prince of Persia: Sands of Time is an action adventure film in which Jake Gyllenhaal plays leading role as Dastan a sixth-century Persian prince. He said about doing his own stunts in this film, "I'm tired of taking myself so seriously.” The film stars are Gemma Arterton, Ambika Jois, Alfred Molina, Reece Ritchie and Ben Kingsley. The film is directed by Mike Newell (Harry Potter and the Goblet of Fire) and the movie will be released on May 28, 2010. Check out the other full pics Here.